Following upon the first observation of a Gray-crowned Rosy Finch at Kokanee Creek Provincial Park, I saw a Pacific Loon at the same location. Well, truth in advertising, I only saw it because Paul Prappas alerted me to its presence. Yet, his observation ranks as a first for the Park. There is more than one species of loon. 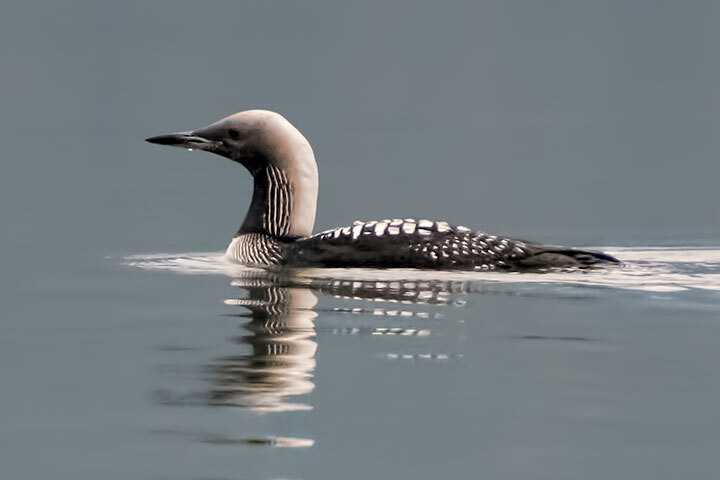 We normally see the Common Loon, but today’s sighting was of a species of loon rarely seen in British Columbia outside of Pacific Coastal waters. A Pacific Loon (still in breeding plumage) graces the waters of Kokanee Creek Provincial Park. Beautiful! Are there more unusual sightings in the area than usual this year? Judy, I have scant way to judge this. That is a beauty, Alistair! Judy, I would not say that this year has produced more rarities than past years. In fact, a couple of years ago, we had several amazing rarities – Lucy’s Warbler, Chestnut-sided Warbler, Ovenbird and Ferruginous Hawk. The key is for birders to get out and bird! The more birders, the better the odds of finding something unusual. I’m sure that many rare and unusual birds pass through our area every year without ever being sighted. Thankfully, there are now quite a few more birders, both experienced and new, out looking for birds in the Central Kootenay. The key is for birders to get out and bird. And failing that, for twitchers to twitch. Or, stay at home and read about the Yellow-Billed Loon in a wonderful book called Kabloona and the Yellow Kayak.